No, those harmonious quotes aren’t by me, but part of the song ‘Istanbul’ by the rock band ‘They Might Be Giants’. While this song is super catchy and your feet can’t help but tap along with it, this simple song sums up the history of Istanbul, more or less. So come along with me, let’s walk along the yellow brick road filled with enticing stories, all the way to the city of Istanbul. In the year 657 BC, a Greek colonist Megara came and settled in Byzantine and made it the new capital of the Roman Empire. Little did he know, this small decision of his would spin a yarn of history that would span over a 1000 years, and this city of Byzantine would become a seat of power for two strong empires to come and would change names and history over the years. The Eastern Roman Empire also came to be known as the Byzantine Empire, and it thrived in terms of culture and art. The Byzantine era, till date is regarded as one of the most culturally rich eras. Skip a few hundred years to AD 324. Constantine the Great, heard about this vibrant city and couldn’t resist its pull. Hearing about the already existing Roman patterns of urbanism, Constantine made his way to the city of Byzantium. He came, he conquered and he renamed the city to Constantinople. The Byzantine empire and its capital city Constantinople continued to grow and thrive. It faced a few ups and downs and a few rough patches, but it was resilient. The emperor Justinian, who ruled between 527-565 AD, helped the Byzantine empire spread from Palestine up to the tip of Spain. He was also the one to build the famous Hagia Sophia church, which since then has undergone a lot of renovation and restoration and has today become a mosque. This powerful Roman reign continued for a good many years, but by 1204, Constantinople’s power began to decline. In another 200 odd years, a storm came in the form of Sultan Mehmed II ‘The Conqueror’ who stormed the city of Constantinople and after a siege of 58 days, the city changed hands from the Roman Empire to the glorious Turkish Ottoman Empire. 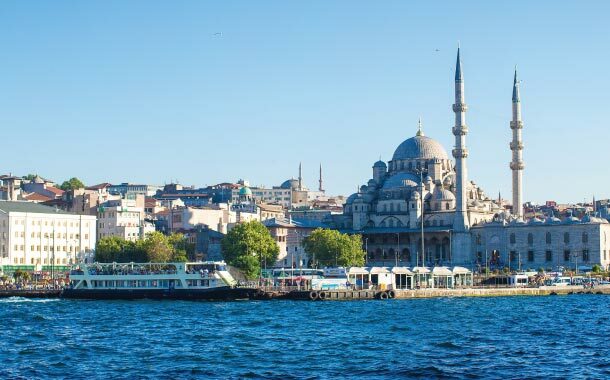 It was this Ottoman Empire that helped create the Istanbul we know today. The famous Topkapı Palace which attracts tourists from all over the world, was the primary palace of residence for the Ottoman Sultans. The Ottoman Empire was also a culturally and artistically rich era, just as its preceding era. This powerful empire covered most of modern day Turkey, Southeast Europe, Western Asia and Istanbul, Constantinople was its third capital. Ottoman literature was known for its Diwan poetry, which were lyrical, metric and filled with symbols. The Ottoman architecture, a confluence of Byzantine, Islamic and Persian cultures has its own page in history. The famous Blue Mosque of Istanbul was built during the Ottoman rule. It was during the Ottoman Empire that the culture and society changed from a Roman one to a more Turkish one. Another important and iconic location of modern day Istanbul, the Grand Bazaar, was built in the year 1455, when the city was called Constantinople. This bazaar houses some of the oldest and largest covered markets, selling anything from jewellery, spices to relics. It’s one of the most visited tourist destinations in the world. So strolling through the Grand Bazaar, you become a time traveller, with one foot in the present and one foot in 15th century Constantinople. The glorious reign of the Ottomans started shaking and came tumbling down in the year 1922. This is also where our yellow brick road ends, delivering us at the foot of Istanbul. The Republic of Turkey was established in 1923 and by 1930 Istanbul was adopted as the sole legal name. The capital was shifted to Ankara and Istanbul became just a city. Even though it’s not a capital today, it’ll never be just a city. A capital of two glorious empires, you can see history entrenched in the by-lanes of this breathtaking place. There is a reason why two of the greatest Empires chose this place as their seat of power and the answer to it can be found only in Istanbul. So go take a journey though the by-lanes of history.